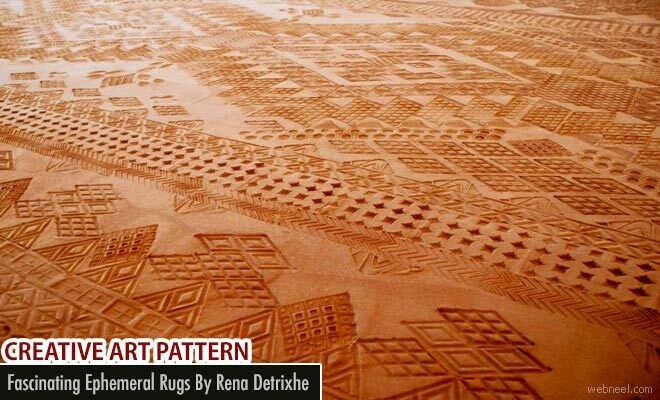 Rug Artworks : Rena Detrixhe, a Oklahoma-based artist creates installations from the finely sifted dirt, ephemeral rugs that she stamps with ornate patterns. She collects the dirt used for the works by hand in and around Oklahoma landscape, which brings an important context to the earth-based faux textiles. According to Rena, “The refining and sifting of the soil and the imprinting of the pattern is a meditation on this past, a gesture of sensitivity, and the desire for understanding. It is a meticulous and solitary act. The form of the rug, from a western perspective, is an object of luxury; it is a symbol of authority and power.” Creation of this art needs focus and concentration as the details are repetitive and important. One of Detrixhe's red dirt rugs is currently a part of the group exhibition Shifting Landscapes at Form & Concept in Santa Fe, New Mexico through May 20, 2017. Visit renadetrixhe.com website to know more.